It's been another busy week of football in London and our local clubs by and large have had a pretty good few days. Chelsea comfortably beat reigning champions Leicester City to stay seven points clear at the top of the Premier League while big wins for Tottenham and Arsenal kept them in the top four. West Ham eased past Crystal Palace to move nine points clear of the relegation zone, while the Eagles were left dangling precariously just above it. Elsewhere, Watford ground out a drab 0-0 draw with Middlesbrough to collect what could be a crucial point come the end of the season. They also remembered legendary manager Graham Taylor who passed away this week at the age of 72. In the Championship, Brentford pushed Newcastle close but were unable to stop them returning to the top of the table as the Toon enjoyed a 2-1 win. Elsewhere there were tidy victories for Fulham and QPR who meet each other this Saturday in the derby. The game of the week in League One was the derby between Charlton and Millwall but as so often happens in these big matches there were no goals and everyone went home a little disappointed. AFC Wimbledon picked up a useful win over Oxford to keep their outside hopes of a play-off place alive while in League Two, Barnet and Leyton Orient both had a weekend to forget with defeats to Doncaster and Portsmouth respectively. Boreham Wood, Dulwich Hamlet, Wealdstone and Welling United all made it through to the last 16 of the FA Trophy while Sutton United earned themselves a replay. 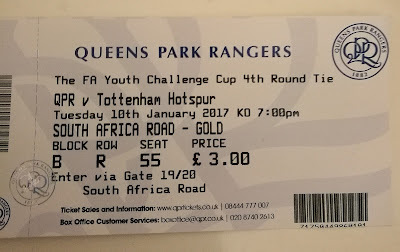 My week saw me take in an FA Youth Cup game for the first time in many years. It's very similar to the senior event but simply features clubs' U18 sides. Probably the biggest story from this year's competition is the news that Hertfordshire non-league club FC Broxbourne Borough (whose senior side are currently bottom of the ninth tier Spartan South Midlands League Premier Division) have made it to the last 16 against sides from some of the biggest clubs in the country. They've drawn Aston Villa away in the next round. Anyway, the tie I saw was the London derby between QPR and Tottenham at Loftus Road. 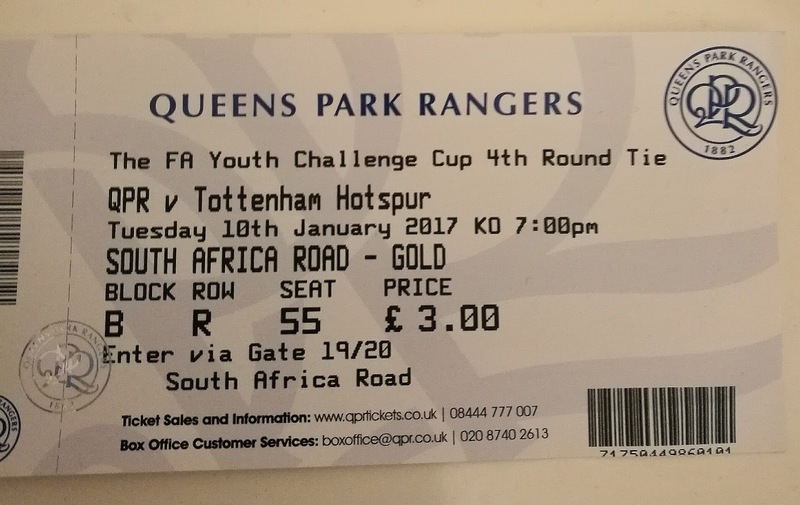 Rangers' youth teams haven't been doing that well this season so I didn't expect much but for £3 and the match a few minutes walk away I thought what the hell. After a game opening few minutes, the hosts were soon under the cosh and went 2-0 down to their classy opponents. Many more chances presented themselves to the visitors but they were squandered before, virtually out of nowhere, QPR pulled one back with a few seconds of the first half remaining to make things interesting. With the hopes of the nearly 700 crowd raised, the players returned for the second half but within another few seconds the visitors were 3-1 up and the R's looked doomed. A fourth was added before the end and Tottenham cruised through to a fifth-round meeting with Norwich City. All in all the FA Youth Cup provides a great way to watch up and coming talent at some of the biggest stadiums in the capital at a fraction of the cost (tickets are never more than £5) so I'd recommend it. There are over 80 matches in the London area over the next week with action in the Premier League, EFL, FA Cup and several minor league and county cup competitions.